An amazing day at sea filled with wonderful encounters of 4 of the marine big 5. As we journeyed through the shallows we happened across a small pod of Indian ocean humpback dolphins, South Africa’s rarest coast dolphin and whale species. 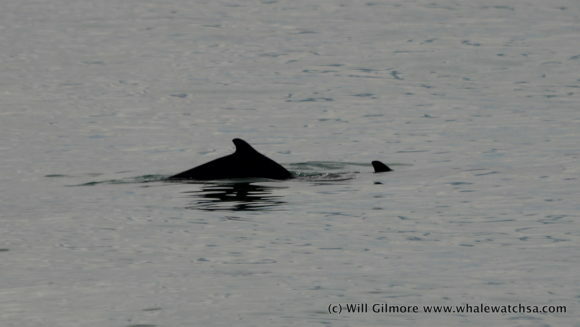 The dolphins were very cooperative today as they surfaced at regular intervals in plain sight just off the boat. 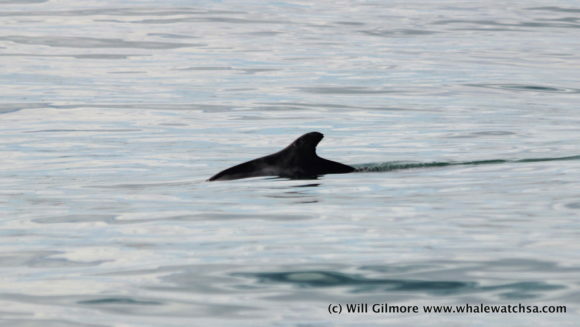 We stayed with the dolphins for some time but soon carried on with the tour towards pearly beach. On our way over De Clyde reef, a reef that runs from the mainland to dyer island. 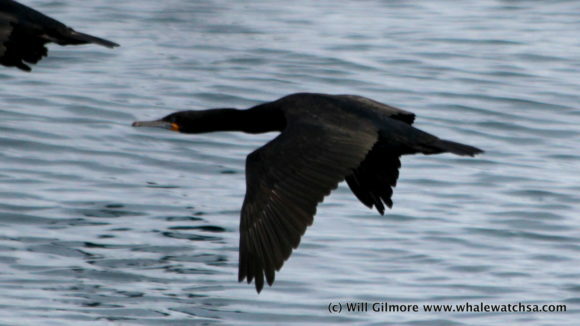 We spotted a massive flock of thousands cape cormorants. 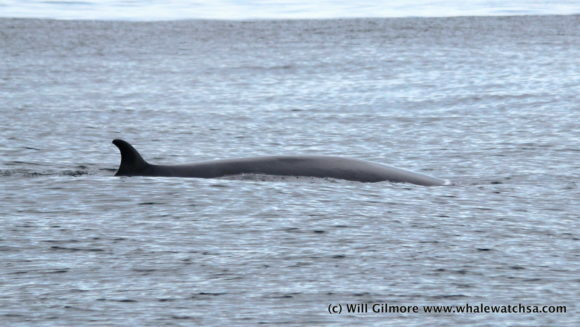 Whilst watching this great spectacle, our skipper spotted us a Bryde’s Whale spout within 100m of the boat. This whale was super corporative with us today, the can usually be quite shy and sporadic with its movements, but this whale certainly wanted us to stick around, as like the dolphins, it was surfacing near us providing some excellent photograph opportunities of the 40-ton mammal. 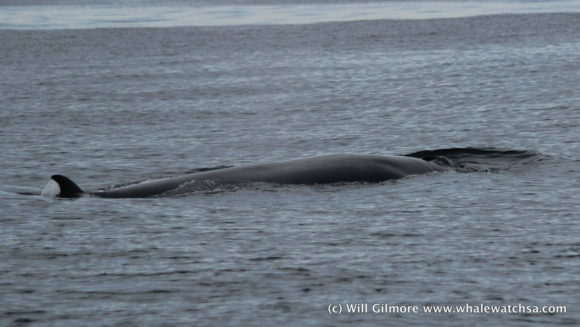 These animals are our resident whale, found off our coasts search for fish all year round. With some excellent cetacean sightings on the first half our tour, we made our way to Dyer Island and the Cape Fur Seal colony. 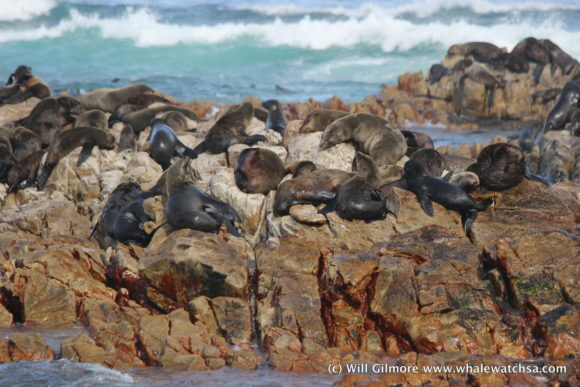 Firstly, we stopped at the seal colony and show our guest the favourite meal of the great white sharks. Even though Geyser rock is situated in shark alley, most of predations occur of the other sider of the island in deeper water where the shark has more chance of a ambushing its victim. 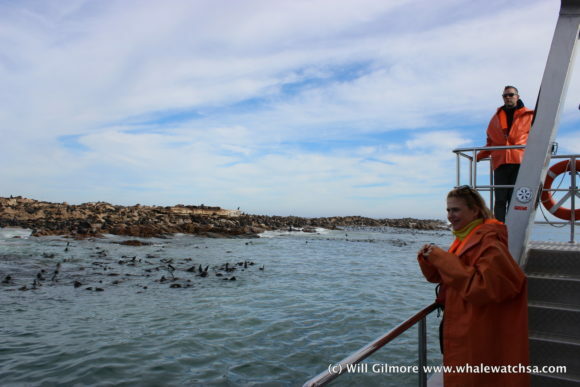 After we had enough of the seals, we made our way into sponge bay at Dyer Island for a very exciting event. 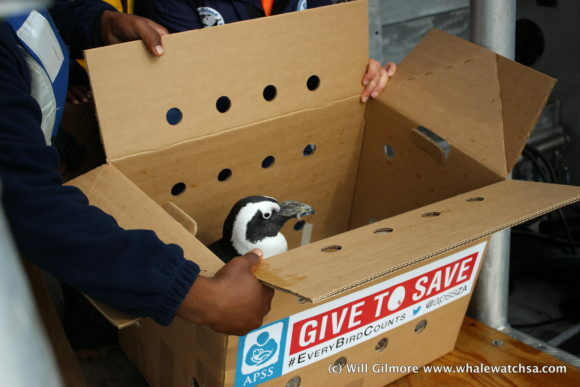 Lucky the Penguin was going home. 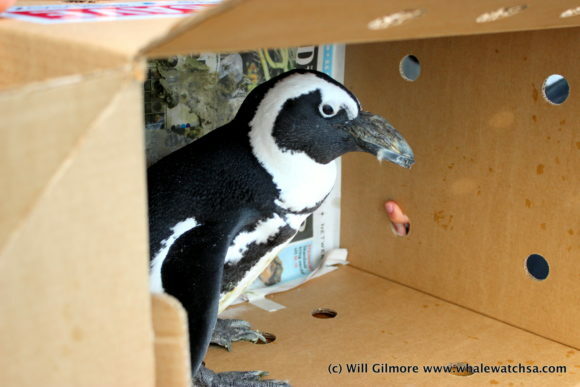 Lucky was bought into the African Penguin & Sea Bird Sanctuary over 18 months ago due to a horrific cape fur seal attack. Lucky was very fortunate to make it to the sanctuary, where the vets surgically operated on his wounds that exposed the air sacks in his chest. 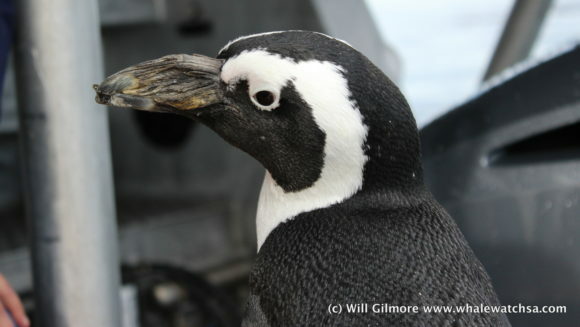 Seal attacks aren’t too common on our penguins, however some have learnt that when these penguins return from fishing they are an easy target filled with a stomach full of fish. 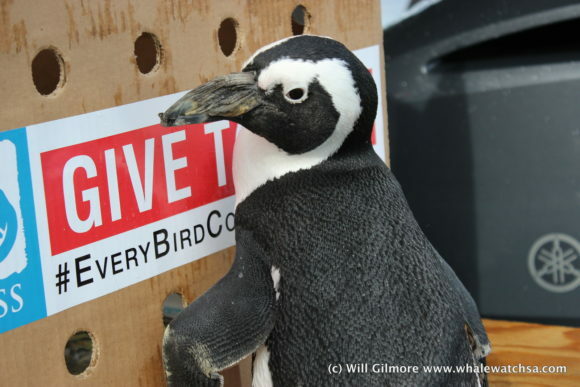 The seal will then open up the penguin to consume the fish and nothing of the bird itself. 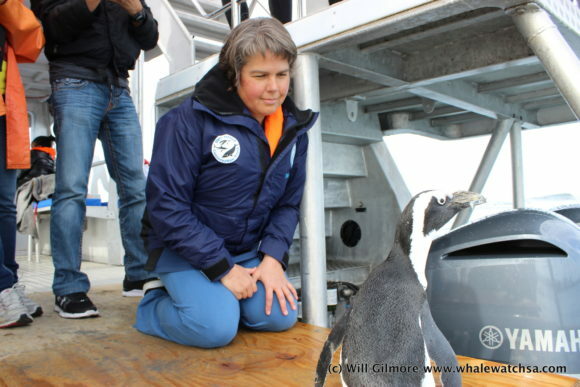 It was a very touching moment between our vet, Theanette, and lucky the penguin as at first he would not leave the boat. Lucky did finally mange to jump off and swim back how towards Dyer Island. An awesome experience that wrapped an great day at sea.